Here we go again folks… Pudding Cookies: Christmas Edition. I LOVE to make different variations of pudding cookies. When it came to thinking of a great Christmas Pudding Cookie, I knew exactly what I wanted to make.. The original Chocolate Chip Pudding Cookie recipe is dear to my heart. It was given to me by my mom and I am pretty sure my grandma is the one who gave it to her. Needless to say, it has been a long time family favorite. That being said, I wanted to do the perfect Holiday Spin to it. When I think of holiday flavors, peppermint is the first thing that comes to mind… and what better than to pair it with Chocolate?! Chocolate and I never stray to far away from one another. These cookies are so soft and so perfect for the holiday season. They would make a perfect addition to your cookie plates this year! Add eggs and vanilla and beat until well incorporated. Stir in Andes Peppermint Crunch baking chips and semi-sweet chocolate chunks. Roll into 1" balls and place on a greased baking sheet. Bake at 350 degrees F for 8-10 minutes. I find 9 minutes to be the perfect number for my oven. You can never go wrong with chocolate pudding cookies. These look fantastic. Chocolate pudding cookies! These sound amazing. They look and sound fabulous - I love the choc + mint combo. I was just looking for those baking chips yesterday but my groc store didn't have them! I've seen them on other blogs lately, too! I think I looked in every grocery store for the peppermint baking chips and I couldn't find them either. What I did though was buy the candy cane Hershey Kisses and chop them up into chip-sized pieces. Worked fabulously and the cookies are delish! Wait a minute...they make Devil's Food pudding??? Where has that been all my life? These cookies look delicious. I think they'd be perfect with Santa's glass of milk this year. I think this is my favorite version yet! I want to make these for a cookie party. How many cookies does one batch make? Thanks! It makes about 3 dozen :) Let me know how they turn out for you! Have a great day! How many dozen did you get from this recipe? oopas didn't see that someone else asked. Yum, yum, yum! We made these today to fill the house with Christmas aromas while we decorated--delish!!! Your recipe is definitely one to put in the Christmas Traditions file of the recipe book. Thanks so much for sharing! These look delicious! I love the chocolate and peppermint combo during the holidays. What isn't good with chocolate =)? Love your blog! I think you and I would make good friends =). Random comment but girl, I want your hair! It's gorgeous! I just made a batch of these as a trial run for a cookie exchange at work. Thank you for making my choice this year so easy. I will not be doing any other tests. I love the Andes Peppermint Crunch baking chips, and whenever I see a recipe that includes them I know it will be a winner. My store did not have the devil's food flavor pudding so I used the chocolate fudge. They are delicious. Thanks! Yum!!! I just printed out this recipe for my cookie swap! Love your blog!! These look beyond delicious! They would be VERY dangerous in my house. Any tips for me on these troubles? These look amazing! I am trying this recipe tonight for a cookie exchange. I have never used instant pudding when making cookies. By small package do you mean the smaller box of the pudding mix 3.9 oz? Thanks! Yes, it is a 3.9 oz box :) I will clarify that in the recipe. Sorry about that. You will have to let me know how you like them! Just made these and they are very yummy. Almost dangerously yummy meaning I can't stay out of the cookie jar. I did make a little change, my store didn't carry the Andes peppermint crunch baking chips, but they did have the Andes peppermint crunch candy, so I chopped it up and added it. It worked great. Thanks for sharing this recipe! I wanted to make these for my cookie exchange this week but haven't been able to find the Andes chips anywhere. Finally found them at World Market. Hope that helps anyone else searching for them! Just made these for cookie exchange. They are wonderful! Thanks for sharing the recipe! 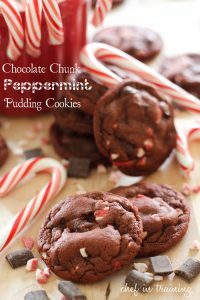 I will definitely check out more pudding cookie recipes! If I use chocolate instead of pudding mix, does that mean unsweetened cocoa and how much? Made these tonight. YUM!!!! I can't wait to try more of your pudding cookies!! These cookies are beyond delicious! Just wanted to let you know that this recipe and your site are feature on my blog here http://cestmoilo.blogspot.ca/2013/01/christmas-dessert-baskets-mmmm.html. Gluten Free Modification-1/2 c almond flour, 1/2 c coconut flour, not quite 1 c brown rice flour, full 1/4 c tapioca and cornstarch equal parts mix-dough was really dry-but sticks together and works well! Didn't spread much, might flatten dough balls before baking a little next time. Very tasty! OH! And I added 1 tsp of xanthan gum. Didn't alter anything else in the recipe. Totally hit the spot! Oh yum! Love pudding cookies! These look heavenly! These are really, really great! My store had no Devil's Food pudding mix, but I got Hershey's Dark Chocolate pudding mix and they came out great. I added a teaspoon of mint extract to the batter because I really love mint. I made three batches of these, to bring to a Cookie Swap, some for the office, and of course a ton for myself and the kids. Thanks for posting! Thanks so much! I am going to add these ones to my list and just make sure I have enough ingredients to make a few batches of them! These cookies seem so simple but they are even better when tasting them! Not too much peppermint or cocoa, Just right! These are addicting!! I made these for work and what a big hit. Thank you for sharing your recipes.